Zero gooood, not zero baaaad ! Continuing my Centos 6 trip, (as Fedora 15 is un-usable by my standards) tonight I'm following a tip to use elrepo for hardware support and rpmforge for video codecs and my favorite media player - vlc. 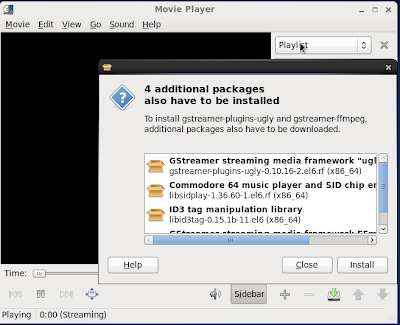 Now to get codecs working just try to play any of your video media with "Totem Movie Player" and because somewhere in Fedora we had packagekit with gstreamer support (good call about that one) you will see a search box like the one below. Supply the root password to install them and magic you'll be able to play your videos. Moving to the hardware bit, last night I managed to get my funky wireless going, but thru an ugly compile hack. I got a tip today about elrepo and looking at the driver version that they offer you can find support for ati, nvidia and ntfs. Broadcom BCM4313 the wireless driver that i needed is not by default offered by them (i guess legal issues) but they are explaining how to use the src.rpm to compile it yourself, with a bit more elegance then the way I've done it. You can read all about it here. Try download and install FC12 - FC13 binary packages. I managed to get avant-window-navigator (but not awn-extras) working under SL6 this way. "as Fedora 15 is un-usable by my standards"
I will write something about Gnome Shell that been my biggest drawback in Fedora.